The word “parity” is to the solar advocate as the word “abracadabra” is to the magician. Through it, all things are possible. But there’s really two kinds of solar parity with electricity prices, and the difference is significant. Take this article from Renewable Energy World last month. It claims that solar installations in New Mexico are at grid parity – i.e. 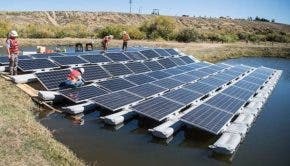 the cost of solar is equivalent or less than the cost of grid electricity – for schools that are buying solar electricity instead of electricity from the power company. It’s true, for these schools and many consumers, the price you will pay for solar from a “third party” (i.e. non-utility) solar providers like SolarCity or SunRun is less than what you pay for power from the grid. I’ll call this Subsidized Solar Parity – when the consumer can buy solar electricity (priced with subsidies) for less than power from their utility. But while the consumer is signing up for less expensive electricity from solar, the cost of energy from that solar array is actually higher. That’s because the solar company selling to those schools is still getting 30% from a federal tax credit, and a further tax savings via accelerated depreciation. So while the ultimate consumer might be paying 7¢ per kilowatt-hour for solar energy, the actual cost of generating electricity from the solar array supplying them is closer to 12¢ per kilowatt-hour. The difference is the federal taxpayer. That’s why I prefer to talk about Unsubsidized Solar Parity – when the consumer can buy solar electricity (priced without subsidies) for less than power from their utility. In the example I just gave, the city of Palo Alto is buying subsidized electricity at 7¢, with an unsubsidized cost of 12¢ per kWh. For most residential electricity customers, this is still better than their marginal electricity price, which is between 13¢ and 17¢ per kWh. So Palo Alto, with relatively high rates and abundant sunshine, has already reached ‘Unsubsidized Solar Parity’. And at the installation cost of $2.15 per Watt that’s generating that price, our interactive solar parity map shows that at least 800 megawatts could be installed at ‘Unsubsidized Solar Parity’ (on commercial property) in New Mexico, as well. Utilities like to claim that there’s a third type of parity, pricing solar energy against wholesale electricity prices (matching solar against the price of power from existing power plants paid off years ago). But that’s wrong, for two reasons. First, in most geographic regions of the US, solar energy competes against the most expensive power during times of peak energy use. And second, it’s more often a resident or business installing solar as a way of lowering their electric bill, which is based on the retail electricity price, not the wholesale. Back to those power purchase agreements for a minute. As solar has become more cost competitive (but the incentives have remained complicated to access), the market for third-party owned solar arrays has boomed. In simple terms, this means you have a solar array on your roof, but someone else owns it. You either lease the solar array to get the solar energy or buy the solar energy on contract. Many of these providers offer customers a lower price for electricity than they pay to the utility. Great, right? Perhaps not. Many of these contracts have an inflation escalator. A reasonable one might assume that the price of grid power will climb by 2-3 percent per year (as it has historically) and the customer’s price will mirror that. But some contracts assume much higher price inflation, 5% or 6% or 7%. Electricity prices have rarely increased that fast over a long period of time, which means that the solar customer may actually end up paying more for their solar energy than if they had stayed with the (dirtier) electricity from their utility. For many customers, that won’t matter. But as solar goes mainstream, the price comparison will be that much more important. Confusion about solar parity is also going to create a significant issue with equity. While the price of solar has tumbled across the country, places reach parity based more on their local electricity price or solar resource. In the near term, it means that in places like southern California or New York – already at ‘Unsubsidized Solar Parity’ – the federal tax incentives will be financial gravy to solar customers or installers. Meanwhile, solar seekers still need incentives to be competitive in places like Minnesota or Illinois. The looming reduction in the federal solar tax credit may not matter for well-established solar markets in the sunniest regions, but it could present a big problem in emerging markets. 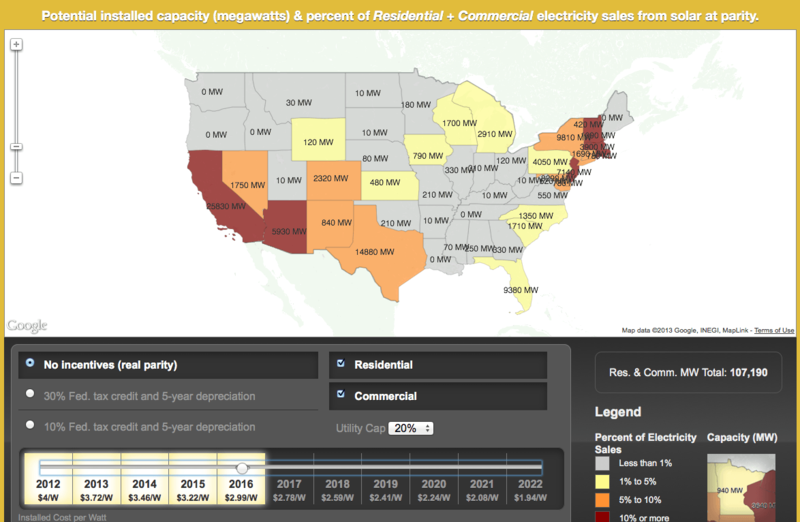 See ILSR’s interactive solar parity map for more on the geographic disparity. While it makes a great headline to claim solar is delivering energy for less than utilities, it’s disingenuous to do it on the basis of subsidized prices. Additionally, the prices reported may be based on contracts with escalators that won’t match grid price inflation, or that may reflect a geographic imbalance in solar incentives. 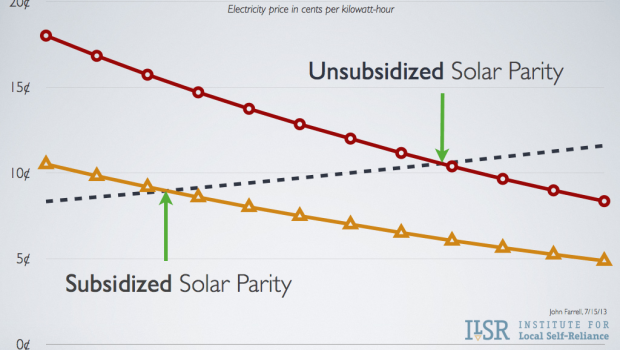 Besides, there’s already a remarkable story to tell about Unsubsidized Solar Parity. Even at $3 per Watt, there’s 100 gigawatts of solar that could be installed at parity with out subsidies across the country. Now that’s what I’d call magical.